Believe it or not, there was a period in time when dunking the basketball was frowned upon. We know it may be difficult to process, but it’s true. Dunking was considered showboating. It violated the sanctity of the game, the antithesis of the fundamental. If you ask us — and most fans of the game — we’re super happy that’s no longer the case. The fact is, dunking is awesome. It’s electric and crowd-pleasing and has the ability to swing the momentum of a game. But more importantly, dunking is further proof of just how athletic some individuals actually are. And while the feat has become so commonplace in this day and age that folks tend to take the act for granted, we’ve decided that’s unacceptable. So we’re here to do something about it. Over the course of history, there have been some epic dunks. This new series is our way of paying respect to those slams that took our breath away. To remember that, while players at all levels of the game have been dunking for awhile now, sometimes, a flush comes along that forces you to remember just how truly special the act actually is. So without further ado, welcome to the first of many, Throwback Throwdowns. Welcome to the time Vince Carter set the international stage on fire. Despite a few close contests, the United States Men’s Basketball Team pretty much had it’s way with the competition at the 2000 Summer Olympics in Sydney, Australia. 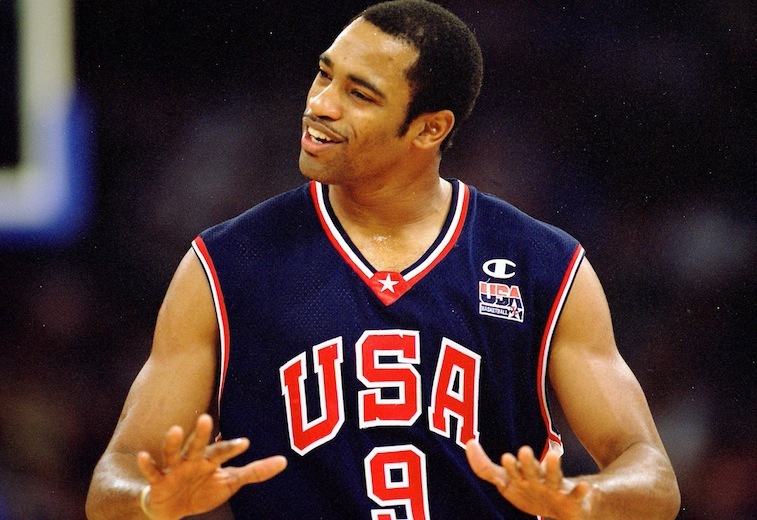 Yet, this isn’t about how Team USA ran the gauntlet during those games on the way to an eventual gold medal, it’s how Carter went all “Vinsanity” on Team France; specifically, center Frederic Weis. On September 25, 2000, Team USA and Team France took the floor for a group-stage clash. With a little over 16 minutes left in the second half of the contest, and the United States up 69-54, a member of the French team threw an errant behind-the-back pass on his team’s side of the court that wound up right in Carter’s hands. That’s when the magic happened. Carter took two dribbles then took to the air, jumping OVER Weis — who was 7-foot-2 — to throwdown the most vicious, powerful, and eye-pooping slam in the history of the Olympic games. It’s one of those moments you have to see to believe. And each and every time we watch it, we still don’t believe it. Carter, himself, couldn’t believe it. No human being should be able to jump that high; let alone, with such force. Then again, Vince Carter was no mere mortal. The United States would go on to win the game 106-94, yet it’s this one play that everyone remembers. It was dubbed “Le dunk de la mort” — the dunk of death — in the French media. Sounds about right.